I love to improve my life, and this is my strength. Am I able to make a change in a day? When I discovered that I needed a self-care plan, I felt energized and thrilled. I dreamed about my new self-care plan and my new personality!! “This time” I told myself, “This time is different”. I read some books, I followed amazing courses, I bought a new diary….the first day I followed a lot of useful advice and I felt very proud of myself but…. But the next day, after a long day at work, the only thought was my couch and my soft warm blanket, and I gave in. I was snug as a bug in a rug. And so, I was back to where I had started plus a lot of frustration because I had failed. One day I discovered what for me was a new approach called Kaizen. These words reassured me. I needed to avoid the temptation of getting impatient and taking bigger leaps one day and the next day falling back into the old routine. I discovered a new thing about myself: the small steps reassure me. I feel comfortable. One little step doesn’t scare me because I know that I can do it. I don’t feel the fear of failure. I admire people who manage to stop smoking overnight or spend a day being lazy, but I need to take small steps. I started doing one tiny thing for myself every day. I realized that I could do something for myself in three minutes! Amazing! For the first time I felt satisfied because after a week I haven’t failed. I felt proud of myself and I felt a new feeling: I was kind toward myself and connected with my real needs. I have never stopped my “three minutes' practice” and my life is more meaningful, more abundant and more authentic than ever. 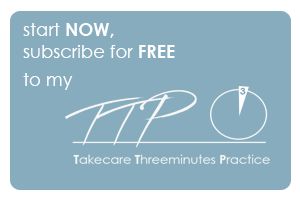 “Takecare Threeminutes' Practice” is one of the simplest ways that I have found to consistently improve my wellbeing and happiness. The only one that has got me over my fear of failure. Do you feel the fear of failure like me? Do you think that you are too busy to introduce something new to your routine? Do you get excited at the beginning, but somewhere along the way, enthusiasm fades and the exciting new practice is abandoned? It’s time to give to yourself a new chance. What if three minutes could change your routine and change your day? It’s easy. Right? What do you really have to lose? Is three minutes enough? Yes. Because three minutes is enough to stop the fear of being selfish, because you know that you need only a few moments and then you can go on with your daily routine. Because you feel that you can do it. • In 2018 I want to do something for myself every day. These goals can work, but they are big and overwhelm you because they add a lot of pressure to life. We know that it’s necessary to take care of ourselves but…”how and when” questions cause a sort of frustration in your life. Instead, forget the big goal and begin a journey with TTP. Your journey can be enjoyable and endless. It is a journey that will form habits, and a habit is created by assembling a chain of individual behaviours. These individual behaviours, over time, lead us to our full potential, and ultimately give us the life we want. Will TTP improve my daily life, my strength and my self-esteem? Yes. because you will learn to love yourself. A TTP is a habit, which is simple, short and enjoyable. Let a simple action guarantee your success and make it much easier to progress over time. Using my TTP, you can finally build your self-care habits through simple, short and enjoyable actions every day. Remember that you are the most important person in your life and you deserve to love yourself. Take your time to choose among my TTP and try one each day.